View More In Pin Vises. For aluminum Hand Drill hobby. 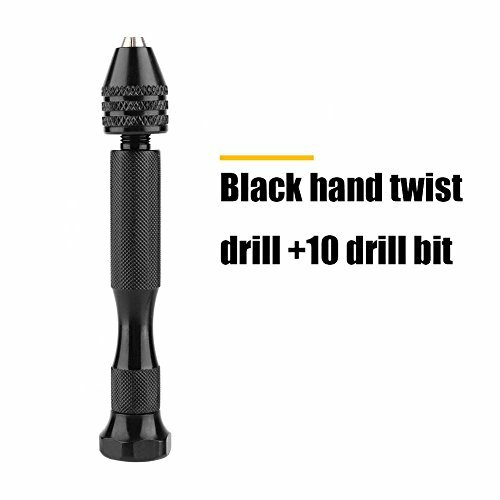 Mini wood hand drill chuck for jewelry tool micro twist bit. Precise, Accurate and Efficient. Suitable for wood, plastic,rubber,model and others material to drilling hole. Do not fit steel, iron,stone,such hard things. Perfect for Drilling Wood,Jin Gang,Linden,Horn,Olive,Walnut,Plastic and other materials. High precision,can clip 0.3 3.2mm drill bit. MEET ALL YOUR NEEDS: Adjustable chuck head allows up to 10 different sized drill bits giving you diversity in the jobs it can complete. MULTI-PURPOSE: Suitable for wood, plastic,rubber,model and others material to drilling hole. Precision hand drill is used to hold and rotate small drill bits for working on models, jewelry, beads, plastic, wires and many other DIY projects that call for drilling precise holes. BEST GIFTS: Our product is the best gifts for friend/ parents who likes to DIY, and perfect for handmaking hobby.